See The signage above? Boy does it cover a lot of territory. Everything from I need to be honest with myself to I can't believe there are more hiccups in the continuing saga in Geoffrey's health journey . Trying to keep this short and sweet to the point yadada yadada and so on. I finally bit the proverbial bullet and ordered a new laptop. It should be here this week and then sometime in the next week there should be a real live blog post that doesn't require me chasing photos over multiple photo galleries to the point of tears. "How can a woman who can place an indwelling cathatet in a less than appreciative feline not make this work???!" As you can plainly see at this point even getting my paragraphs shaped up has become an issue. While dancing over a screen smaller than a piece of toast and one needs an app which doesn't work very well to accomplish even that. A nod to all of my fellow bloggers who are currently freezing their tush off. We do feel your pain here in true Nor Cal! 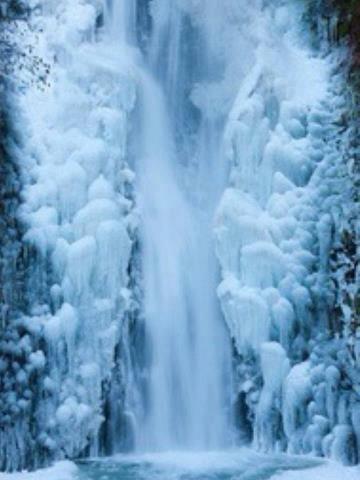 The photo above was taken of Burney Falls about an hour from my the farm in 2013. That was the winter we got our Artic Blast and it didn't come from Dairy Queen. For this girl from the flatlands of the central San Joaquin Valley the absolute thrill of having cold and snow in my own backyard was a gift, a treat for about one week. When it became apparent that after day eight it wasn't warming up anytime soon with lows anywhere from -3 to 5 degrees and highs of 12 to 13 degrees and hauling water in five gallon buckets twice a day to the goats and chickens the thrill was waning if not becoming down right old. By the beginning of week three it was down right coyote ugly. But thaw it finally did and a lesson was learned. It is pretty but when your barns aren't build for extreme cold and no matter how hot the fire is it never got really warm that lesson was "watch out for what you wish for you just might get it." As I said we understand. This winter has been mild in comparison. We are finally getting more rain. Which is a great blessing as when we get rain we get grass in the fields which makes the goats eyes light up and my feed bill go down. Now that makes me smile. The last few months have been preoccupied with Geoffrey's health. I can report that currently the CLL (chronic lymphocytic leukemia) is not active but not yet declared in remission again. The chemo treatments have ceased for now. To every up side there is a down side. Hey that is is life. So we are now currently tackling a list of issues that were revealed by the same scan that showed the state of inactivity of the leukemia.We are dealing with one thing at a time in a triage fashion and a list of about half a dozen potential problems. I am slowly working on a couple post that will bring you up to speed on the farm and fiber activity. Trying to use the blogger format and not the app for doing it. I must say that if I had known what a pain it is to do that I would not have opted for just getting an iPad. I may be getting a new laptop as blogging is important to me and I would prefer an easier format. I am interested in your opinions on a dependable lap in the $300 range. My last one was an HP with a life of five years . I am not a Dell fan after several issues which left me with a bad tastes for the company. I realize that isn't much of an investment but since I do have the iPad I need a laptop with the basics not a lot of bells and whistles. Thanks ahead of time for your suggestions.